River banks, sandy shores, and (as at Isle Royale) hollows in rock outcrops. Known in Michigan only from a very few locations in the Upper Peninsula and apparently near Alpena. The leaves have a distinctive lustrous and velvety appearance beneath, the pubescence ranging from rather silky to somewhat tomentose. Staminate material of this species has only very rarely been collected, and no pistillate specimens have been made in Michigan. A form with the leaves glabrate beneath, and often with twigs scarcely if at all glaucous [f. psila C. K. Schneid.] 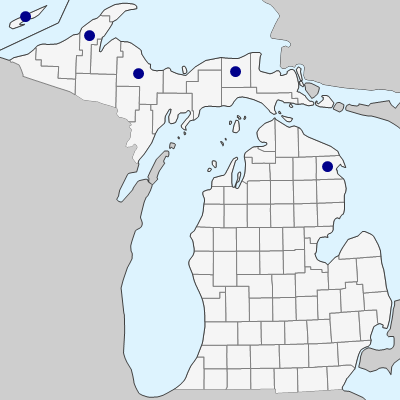 is frequent along the north shore of Lake Superior in Ontario and has been collected on the upper beach of Lake Superior in Luce Co.
MICHIGAN FLORA ONLINE. A. A. Reznicek, E. G. Voss, & B. S. Walters. February 2011. University of Michigan. Web. April 24, 2019. https://michiganflora.net/species.aspx?id=2635.